Robert Franz was born as Robert Knauth, but his father changed his last name in Franz this also became the last name of Robert. His parents objected to a musical career, but when he was twenty he was allowed to study organ playing in Dessau under Schneider. There he learned the works of Bach and Händel. He published a book of his own songs in 1843 and it was favourably received by both Schumann and Liszt. Many more books would follow and Franz became organist of the city of Halle and held other positions in that city. He suffered from increasing deafness since 1841 and a nervous disorder followed in later years, forcing him to resign from his positions in 1868. He received the receipts of a tour from Franz Liszt and Joseph Joachim to secure his financial future. Around 1878 he searched in Germany for Bach manuscripts, eventually finding a Bach manuscript holding a couple of young trees together near Schloss Witzthun. On further inspection he found an entire trunk of Bach manuscripts. 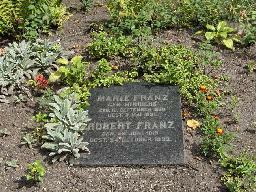 The grave of Robert Franz at the Stadtgottesacker, Halle.